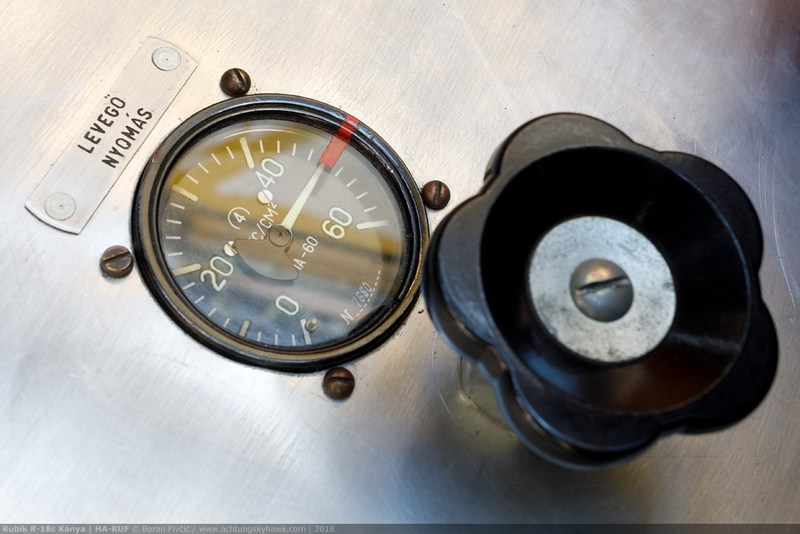 Photo File – Rubik’s Tube: Rubik R-18c Kanya, HA-RUF | Achtung, Skyhawk! 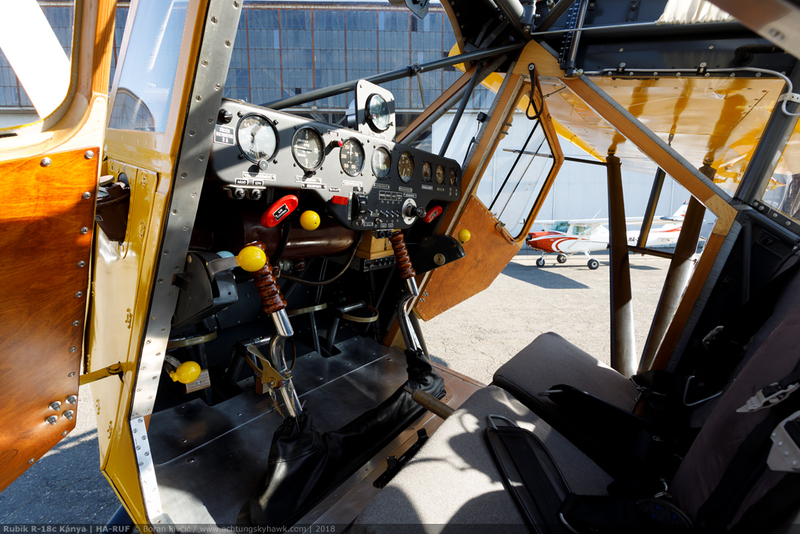 I’ve always said that only good things can happen when you use your off time from flying airplanes to – photograph airplanes. For me, this was very much the case recently when my itchy photo finger led me into neighboring Hungary in search of interesting indigenous and Eastern Block flying machinery. And while almost every airfield there is a gold mine in one way or another, my travels that day had taken me straight to Budaörs Airfield (LHBS) just outside Budapest, a well-known GA center in its own right – but doubly more interesting as the home of the Goldtimer Foundation. An eclectic group of enthusiast dedicated to preserving the country’s rich aviation heritage, it is most famous for its flagship, the world’s sole airworthy Lisunov Li-2 – a Soviet license built version of the early C-47 that had needed so many alternations (1400+ by some counts) to survive life in the Union that it pretty much became a standalone type. Rarity: check. STOL credentials: check. Russian radial: check. Yellow paint: check. Everything’s here! While it may lack the pedigree and heritage of similar designs East or West, the R-18 nevertheless ticks many Achtung, Skyhawk! boxes right from the start – not least of all for its interesting origins. 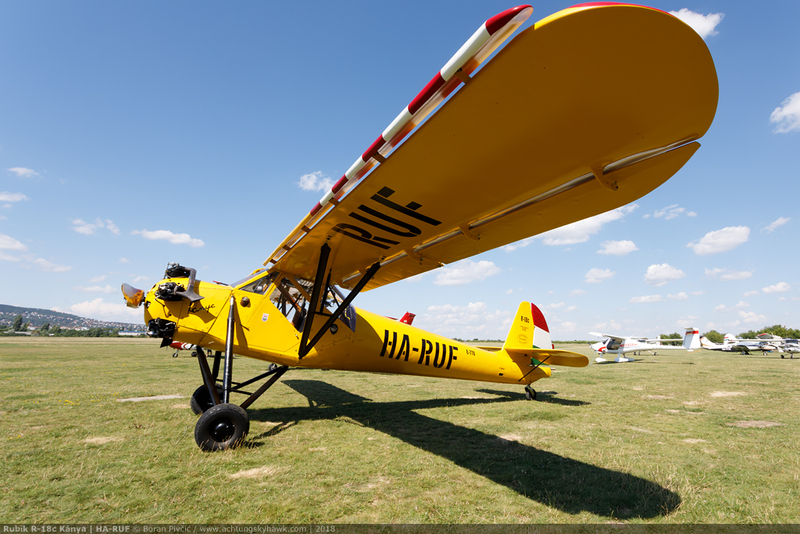 Designed in 1944, the R-18 was penned by Ernő Rubik (father of the same Ernő Rubik who would much later design the eponymous cube) and was intended to fill the niche for a cheap-and-cheerful STOL utility aircraft that could also double as an effective glider tug. Despite nowadays being known solely due to Junior’s successes, Rubik Senior was at the time already a prolific aircraft designer*, and was thus intimately familiar with the challenges of producing a rugged and dependable working aircraft on a tight budget. 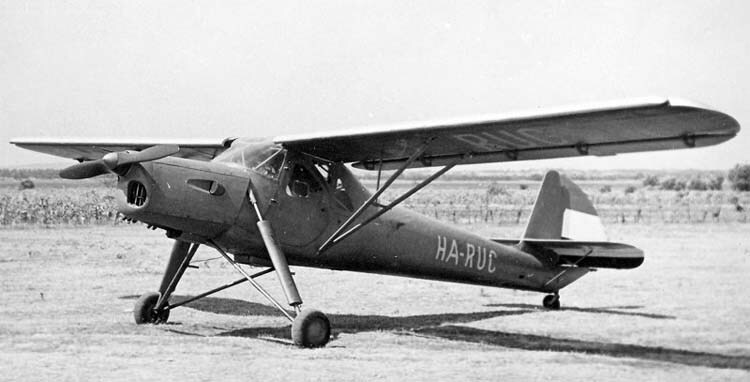 Though the R-18 was never a direct copy (being much smaller for starters), to make it work Rubik had from the outset used the superlative Fieseler Fi-156 Storch as inspiration, adopting its solutions such as large fixed slots along the wing leading edge, wide-span drooping ailerons, a mixed wood/metal construction to save on strategic materials – and a tall landing gear that could both cope with the realities of rough field operations and provide sufficient drag to allow for steep approaches. Unlike its idol however, the R-18 would not have folding wings, a powerful engine with a constant speed propeller, provisions for light armament or quite the same insane level of STOL performance – all compromises made to simplify design and construction and keep production costs manageable. * what’s more, Rubik Sr. would continue at it even after the war, turning his attention now to gliders (on which he had actually made his name before the war). The most successful of these new designs was the R-26 Góbé of 1961, a simple all-metal two-seater with a moderate 14 meter wingspan. Though production had ended in the late 60s after 115 examples were made, the design would come back to favor again in the late 80s, when a modernized version – the R-26SU Góbé 82 – was put into production by a Hungarian automobile plant. Despite this unorthodox return and the availability of the Let L-13 Blanik, a further 78 examples would be completed and sold, a large proportion of which continue to happily fly to this day. 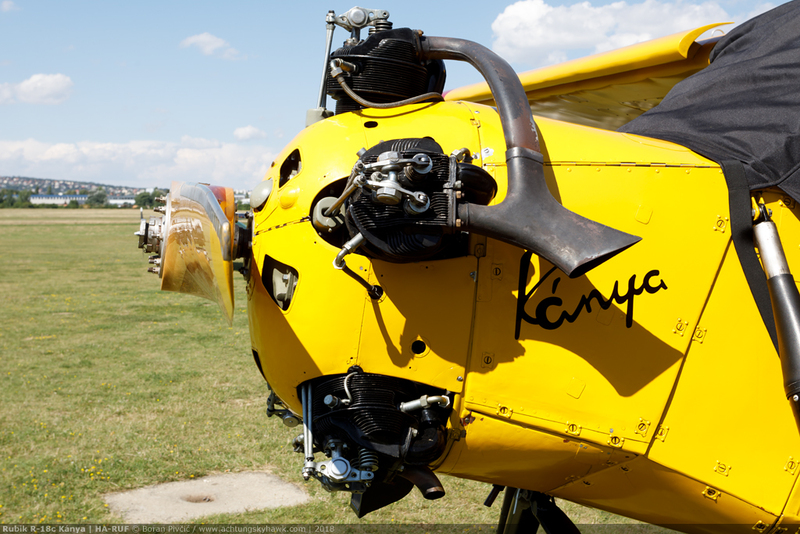 In spite of its down-to-earth design goals, the R-18 – now named Kánya (“kite”, a species of hawk) – would not see the light of day until the end of the war. The German occupation in May of 1944 and the arrival of the Red Army in September had had a catastrophic effect on the country’s aviation industry, which made producing even such a simple and basic no-frills aircraft a very tall order indeed. In the event, the first Kánya – the R-18a, carrying the serial E-524** and military ID 1-002 – would be completed only in 1948, flying for the first time on 18 May 1949. 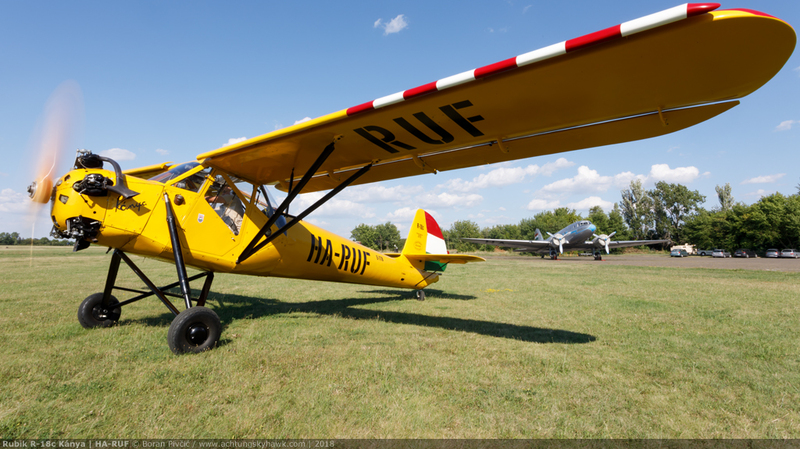 ** like many Hungarian light aircraft, the R-18 family was produced by the state-owned Sportáru Termelő Nemzeti Vállalatnál aircraft factory at Esztergom (now LHEM) in northern Hungary. This was reflected in their serials: E-524 may sound exotic, but it simply meant 1-002 was the 524th aircraft produced at Esztergom so far. In its original guise, the R-18a was a pretty clean three-seater (two in the front, one in the back), powered by a Czechoslovak Walter Major 4-I engine which developed a modest 130 HP from four inline cylinders, and spun an unremarkable two-blade fixed pitch propeller. 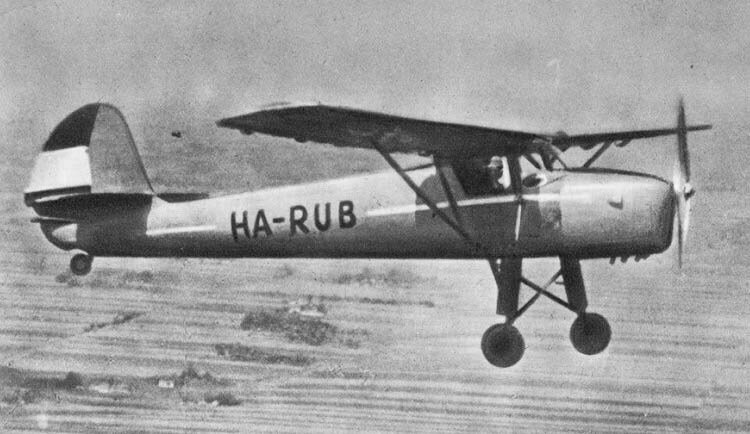 Interestingly, Rubik had envisioned the Kánya to be powered by a British-made inline engine (such as the 135-150 HP Blackburn Cirrus Major), but the post-war political situation in Hungary had quickly sent that idea down the tubes. Originally pitched to the reformed Hungarian Air Force, 1-002 would quickly be made redundant by large numbers of readily available aircraft coming from the USSR (most notably the Polikarpov Po-2), which left Rubik with only one option – to go civilian. To this end, 1-002 would be transferred to the civil register, becoming HA-RUA the same year. 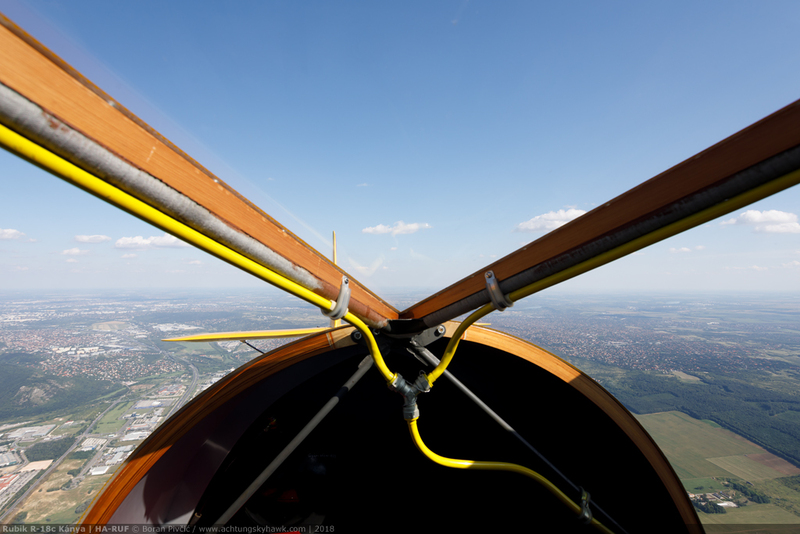 Unfortunately, not long afterwards it would be involved in the type’s very first accident, when it stalled at low altitude and sideslipped into the ground during a glider tow demonstration. Even though the damage was repairable, the aircraft was not rebuilt and was instead re-purposed as a training aid for apprentice mechanics. 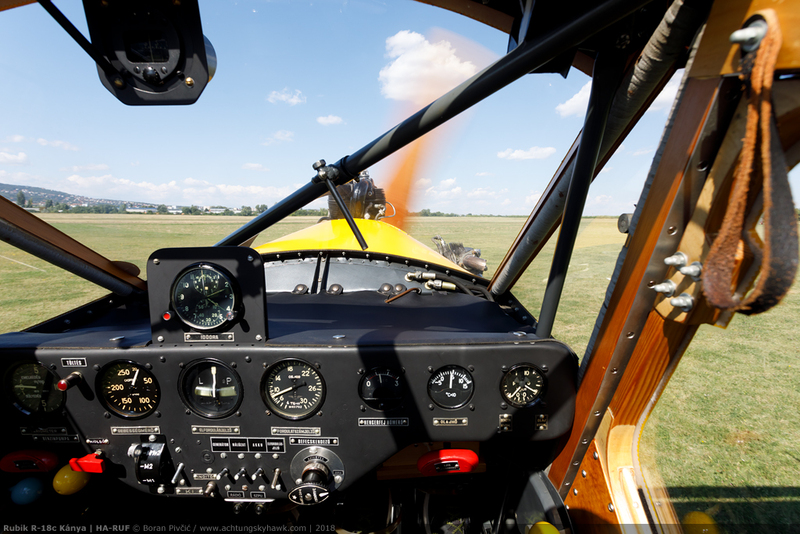 Based on experiences from military test flights and civilian trials, Rubik then developed the slightly improved R-18b, whose primary claim to fame was a redesigned fuselage around the rear seat, allowing the second passenger a bit more breathing room. As was the case with the A, only one B model would be made, wearing the serial E-552 and registered HA-RUB. Like its predecessor, it would meet its end during a glider tow exercise on 25 September 1954, ending up severely damaged in a corn field after running out of fuel. Having been convinced all along that there was more to come out of the basic design, at the very beginning of the 50s Rubik began work on a more extensive update, which would debut in 1952 as the R-18c. Compared to the B model, the C – in the form of the “prototype” HA-RUC (s/n E-761) – packed a more powerful six cylinder Walter Minor 6-III developing 160 HP, as well as a cut down and extensively glazed rear fuselage. 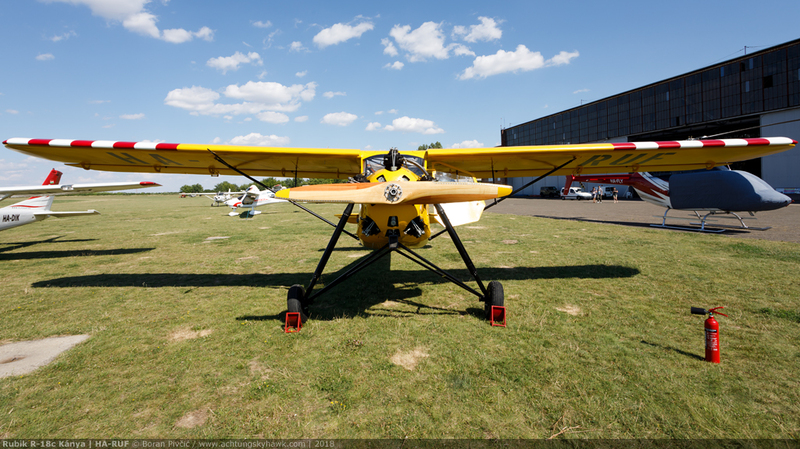 The new powerplant was initially delivered with a two-blade Avia V410 variable pitch metal propeller – but unspecified problems with its reliability had quickly seen the switch back to a classic fixed pitch wooden unit manufactured right at Esztergom. 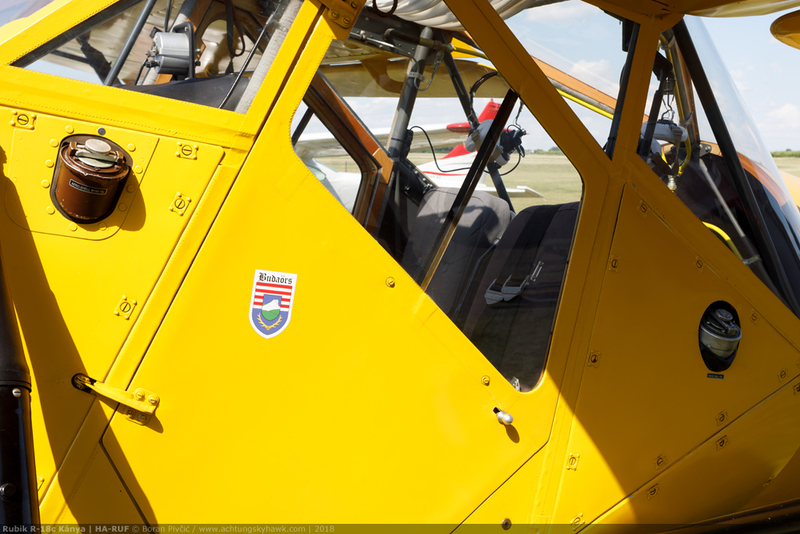 Having caught some flak due to comfort issues with the A and B models’ rear seat, Rubik would soon dump it completely and replace it with a 120 l fuel tank to augment the two standard 60 l tanks located in each wing root. In this tweaked form – which one source calls R-18c/1 – the C would become the first, and last, R-18 to enter any form of series production, with just six further examples completed between 1952 and 1953 (registered HA-RUD through HA-RUI). The reasons for such a short production run vary from one source to the other; but staff at Budaörs had told me that the R-18 was simply a casualty of Eastern Block politics of the time, which prioritized the import of aircraft from large factories abroad over small-scale indigenous production. Thus, like the original A model, the Kánya as a whole was simply swept away by a tidal wave of Polikarpovs, Yakovlevs and Zlins rolling in in their hundreds. To add insult to injury, the Minor engines would prove to be quite problematic and failure prone in Hungarian service, leading to a disproportionate number of incidents and write-offs; indeed, some sources claim that by 1966 – when the type was withdrawn from service – only two aircraft had remained intact. This rate of attrition had between 1955 and 1958 prompted a fleet-wide re-engine program, in which the Minor was thrown out in favor of the Shvetsov M-11 five cylinder radial used on the Po-2 (and manufactured by WSK-Kalisz in Poland), developing either 125 HP in the D model – or a more substantial 160 HP in the FR variant. Unlike the home-grown props used with the Minor, both M-11 variants would be bundled with the “factory default” WD-450, also made by WSK. Interestingly, there was only one other structural mod attempted – and that was fitting skis to HA-RUE (s/n E-763). The aircraft was subsequently based at Budaörs, but I had been unable to find any photos of it in this configuration. The world’s sole airworthy R-18 to the background of the world’s sole airworthy Li-2… I kind of like it here I must admit! 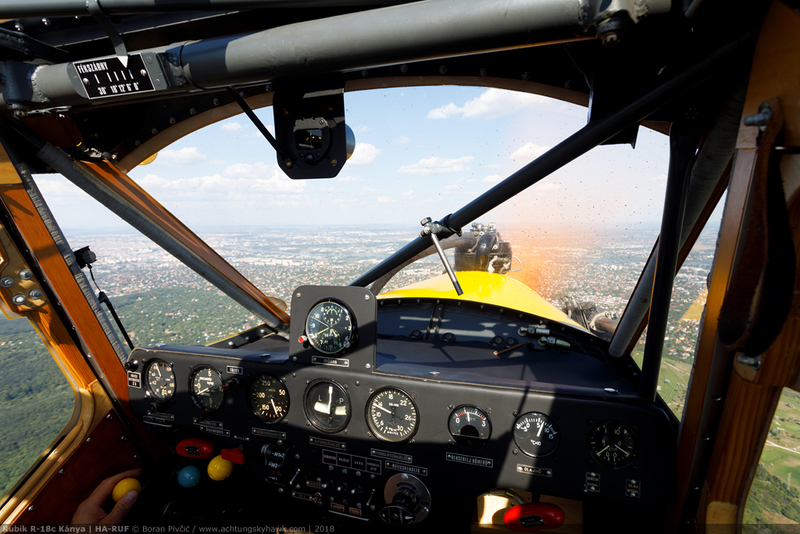 Customarily, I would like to thank everyone at the Goldtimer Foundation for a beautiful flight, especially my pilot, Mr. Gabor Szakacs!